As a mountain guide, what goes on my feet is one of the most important things I consider. Often while rock climbing, figuring out what combination of shoes to take on a long climb is the crux of the packing. When the climb requires a walk off in technical terrain the decision gets even harder. Do I take a very light approach shoe and rock shoes for an easy climb that requires lots of walking or do I carry a more substantial approach shoe where comfort comes first? The problem with the second option is carrying the heavy shoes in the pack can make the climb not as fun. 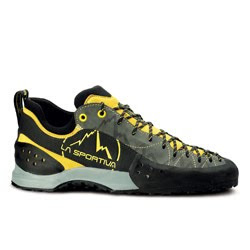 La Sportiva has solved this problem for me with the Ganda. It is half approach shoe half climbing shoe. While guiding in Red Rocks this fall I used the Ganda for climbs up to mid 5.10 and felt very comfortable in them. They are very comfortable for the approach and then climb like a dream. The best part is that I only had to bring one pair of shoes, making the climbing pack much lighter. The Ganda is hand made in Italy. Its craftsmenship is second to none and they should last me at least 5 years! The shoe is designed to take many resoles and athough the cost is high, its value is considerably greater than other approach shoes when you consider it’s longevity. The Ganda is not quite as comfortable as the Exum but not carrying rock shoes is a reasonable trade-off. The shoe is a bit warm due to the beefy construction. So far these are the only drawbacks I have found. For climbs that are moderate in nature and when I only want to bring one pair of shoes the Ganda will be my first choice. This post was great, thanks. If you need more info on a drug intervention programs then you should check out Ken he’s got great experience.